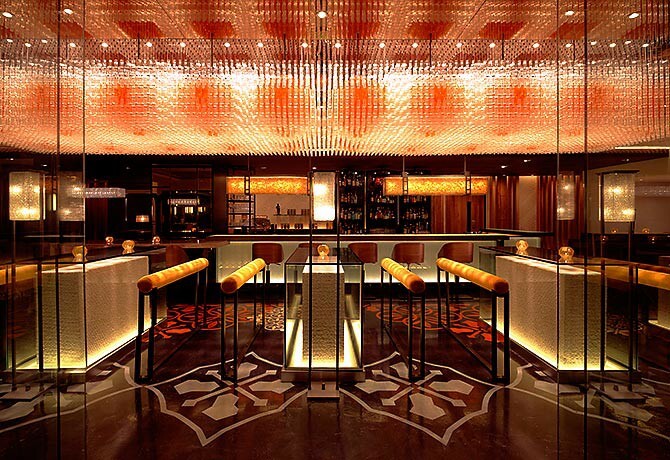 Anti:dote, a tapas bar in the Fairmont Hotel, has been around for a while now. It’s an upscale, stylish venue catering to hotel guests and locals. The interior is rather dark and glassy – the design is modern minimalism with clean lines and hard edges. The place has an artsy, film noir-ish feel. Tom Hogan, Head Craftsman of drinks at Anti:dote, is a bit of artist himself. Having started out as a graphic designer in the the United States, he used his skills to design Anti:dote’s cocktail cards. Each drink in Anti:dote’s new menu is hand-drawn in architectural blue-print style, detailing the drink’s potency, preparation and ingredients. His artistry doesn’t end there. Tom’s principle of mixology is based on using premium spirits and fresh ingredients with plenty of housemade aromatic bitters, liqueurs and flavoured sodas. A big fan of D-I-Y, Tom enjoys growing his own herbs and flowers such Cuban mint, cinnamon basil and marigolds in the bar’s own garden. Some of Tom’s recommended drinks such as Aqua Fresca and Monte are clearly inspired from Central and South America. They contain ingredients such as Mezcal, an alcoholic beverage from the distinctive agave plant; Cachaca, an alcohol distilled from sugarcane juice; and his housemade falernum, a sweet syrup used to mix tropical drinks. Both drinks were strong and complex with many different effects in taste sequence. The drinks were ‘kinetic’ on the palate. The myriad of flavours swirled about with every sip. For me, the vegetal tastes stood out, giving the cocktails strong herbal notes throughout. A 1cm head of white egg foam bearing “blood splatter” made by splashing the Aperol on the surface, graphically depicting the fabled fatal knife wound. To create new concoctions, Tom draws his inspiration from his daily interactions with people, and every cocktail has a story of its own. The Monte, for instance, was named after the ex-General Manager of Fairmont Singapore. 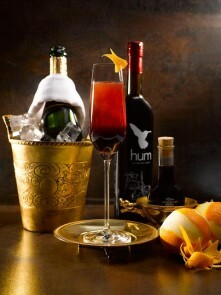 Another is the Seger Seelbach, an homage to a Chicago mixologist, Adam Seger, maker of a liqueur made from hibiscus, ginger, cardamom and lime in rum called “Hum”. Tom mixes Hum with a classic drink called the Seelbach, which consists of bourbon, Peychaud’s Bitters, Angostura Bitters and champagne. That’s a lot of fruit, vegetable and alcohol flavours mixed into one drink! The Tragedy of Tom Dooley created by Tom Hogan depicts a Southern American tragic character within a few cc’s of elixir. Not all of Tom’s drinks are inspired by real people. My favourite drink during the tasting was The Tragedy of Tom Dooley, a cocktail inspired from an American folk song, loosely based on actual events in North Carolina after the American Civil War. Tom Dooley, at the centre of a love triangle, was wrongly convicted and sentenced to die for the murder of his betrothed. Burdened with guilt of his infidelity, he offered no defence and accepted his fate to protect the his other lover, who committed the murder with a hunting knife. The Tragedy of Tom Dooley is made with tequila, Aperol, lime juice, lavender syrup, and egg white. 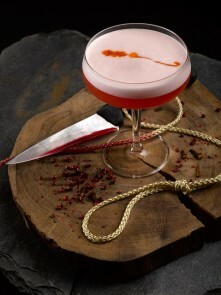 The base is golden orange topped with a 1cm head of white egg foam bearing “blood splatter” made by splashing the Aperol on the surface, graphically depicting the fabled fatal knife wound. A very pretty and graphic drink! The tequila packed a heavy punch with very strong herbal flavours from the Aperol. The overall taste was sharp, contrasting and, of course, bittersweet like a love tragedy! For such an epic story, the size of the cocktail is quite tiny. Perhaps a reflection of Southern gentility? So if you’re tired of the ordinary bar scene, Anti:dote may just be the… antidote! Quite often, Tom will be there to regale patrons with entertaining cocktail tales. Perhaps if you impress him enough, he’ll create a drink named after you. Just avoid anything tragic!